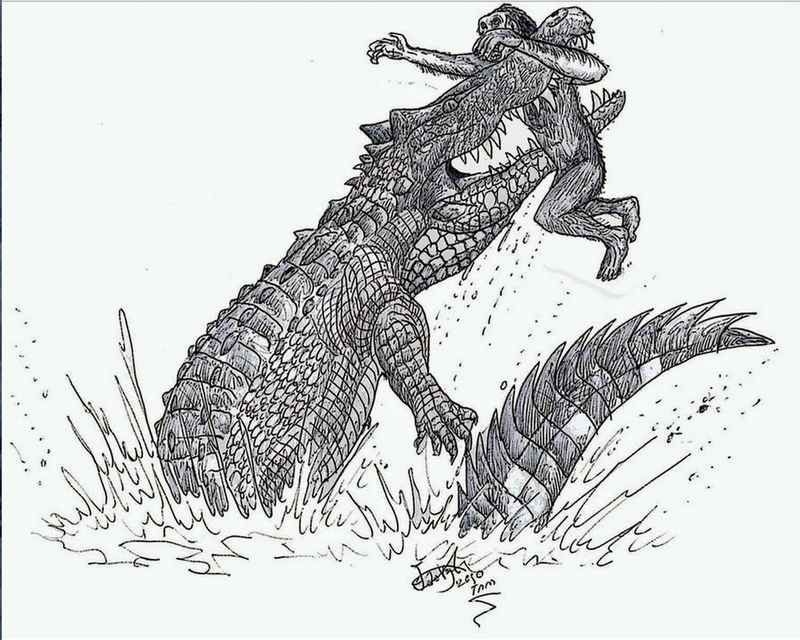 Crocodylus captainawesomeus was first described in 2010 from northern Tanzania in a locality known as Olduvai Gorge, a dry valley hidden within the Serengheti Plains that contains over 100 meters of fossiliferous sediments. Fossils have been described from this locality since the early 1900s, and they date to between 2.5 and 1.2 Million years old. The most news-worthy fossils include 3 separate early hominin* species, the earliest of which was Homo habilis (2.5 - 1.7 Ma), then Paranthropus boisei (aka robust australopiths; 2.3 -1.2 Ma), and finally Homo ergaster (1.9 Ma- 780 Ka). Many anthropologists have made their careers off these discoveries, but the famous Olduvai Gorge locality has also produced an array of vertebrate fauna that aren't nearly as popular to study and don't have entire departments devoted to a single animal Order. Describing one of these things gets you published in Nature - guess which?? But a few vertebrate paleontologists do exist within the African Plio-Pleistocene paleontology scene who will restore your hope in paleoanthropology. 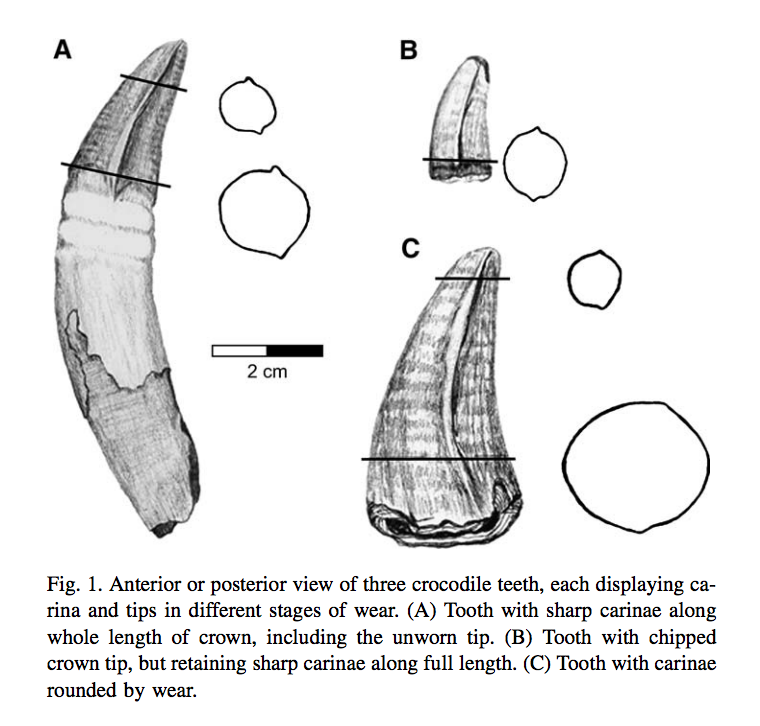 Over the last decade a team of scientists has published a series of papers about the crocodile fossils from Olduvai Gorge and how these crocs played a role in the hominin paleoenvironment. Specifically they focused on the taphonomy of the hominin bones, i.e. anything that happened to the bones between death and the time of burial of our little human "ancestor." Lo and behold, they noticed signs of carnivore feeding damage. Paleontologists Jackson Njau and Robert Blumenschine went to work determining the carnivore responsible for snacking on hairy lil' hominins. They analyzed dozens of fossils from Olduvai Gorge and compared the teeth impressions on the hominin bones to the impression left on a variety of modern day carnivore meals. 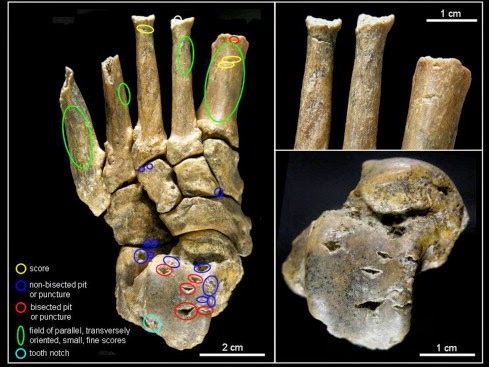 Two of the famous fossils, Olduvai Hominin (OH) 8 & OH 35 displayed clear signs of carnivore feeding. The distal tibia and talus of OH 8 (considered to be Homo habilis) includes bisected tooth marks, which are diagnostic of crocodilian feeding. The scientists believe that the location of the tooth marks on bones indicate the foot was disarticulated by crocodiles. 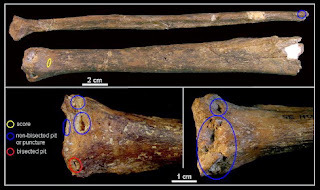 On OH 35 (a left tibia/fibula) the team noticed that the broken proximal ends of the tibia are more typical of the traces left by a feeding leopard-like carnivore. 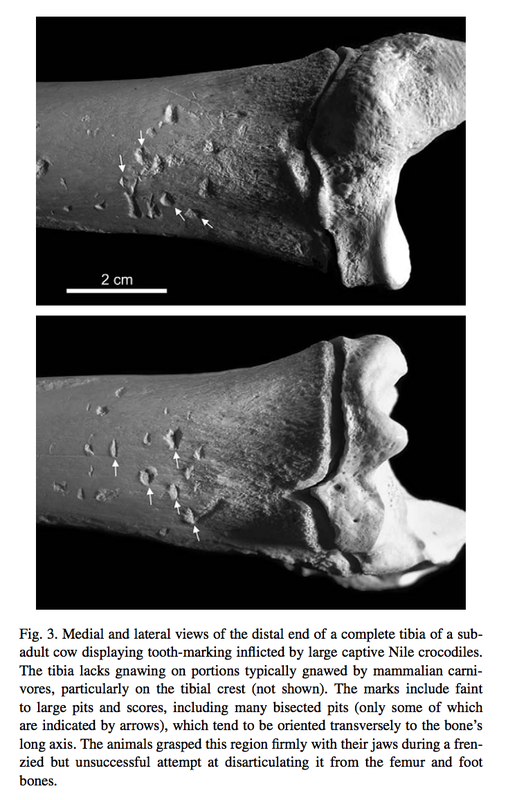 The partial destruction of the knee joint, with crenulated broken edges as seen on the OH 35 specimen, is typical of damage inflicted by leopards on similar sized bovid bones. The evidence is in and it says that humans are - or at least historically have been - delicious. The crocs that fed on our ancestors were really not all that different from the crocs alive today - crocodile morphology has changed very little since their ancestors emerged in the late Cretaceous. Yet in today's world humans are so often considered to be "the most evolutionarily successful," an idea that really depends on your definition of "successful." Sure humans have the biggest impact on the global ecosystem right now, but our lineage has only been around for a couple million years. Crocodiles have been around for over 65 million years, have changed very little, still scare the hell out of people & will still eat you, and haven't destroyed the planet. That sure sounds like success to us. 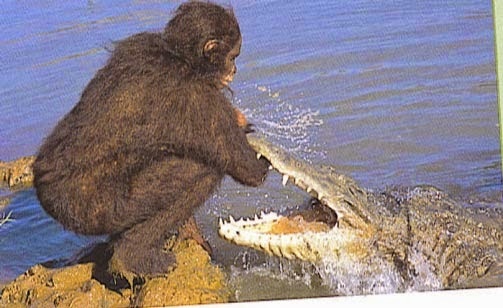 *if you're wondering why we said hominin instead of hominid click here. Brochu, C. A., Njau, J., Blumenschine, R. J., & Densmore, L. D. (2010). 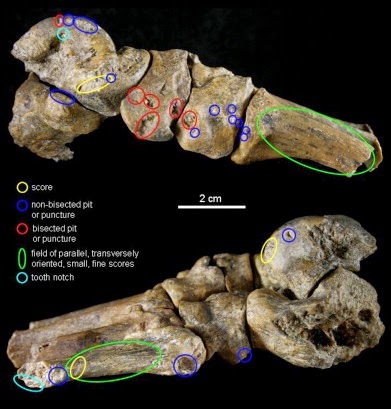 A new horned crocodile from the Plio-Pleistocene hominid sites at Olduvai Gorge, Tanzania. PLoS One, 5(2), e9333. Kappelman, J., Keane, P., Reed, D., Tenbarge, J., Witzel, A. P., Barr, W. A., ... & Russo, G. A. (2012, January). eFossils. org: a collaborative website and community database for the study of human evolution. In AMERICAN JOURNAL OF PHYSICAL ANTHROPOLOGY (Vol. 147, pp. 177-178). COMMERCE PLACE, 350 MAIN ST, MALDEN 02148, MA USA: WILEY-BLACKWELL. Wanna keep updated on our blog and also hear about every minutia of our lives? Follow us on Facebook or Twitter, or Instagram! We also have a Google + account, which is barely one step up from Myspace but whatever, we have one.